Today I got an acceptance to two programs at the University of Edinburgh, MSc in Classical Art and Archaeology and MSc in Mediterranean Archaeology. I adore Edinburgh. Lain and I went to visit for the weekend when we were in Ireland. It’s such a gorgeous city. 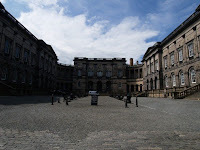 And the University of Edinburgh is one of Europe’s oldest and most prestigious universities. This is a photo I took when we visited the University (notice the wonder that is my wide angle lens). Now I have three different universities and four different programs to decide between. And I have to decide soon. I can see myself being happy at any of the three places, but I know for a fact that I love Edinburgh - and the city I’m about to move to is really important for me. I saw on Facebook that you got in here. MAN, I’m jealous. (I wish my undergrad was ending soon and I had a pile of offers to wicked grad schools in the UK.) No matter where you go I will visit you often. It’s awesome that you have so much choice. You really can’t go wrong.